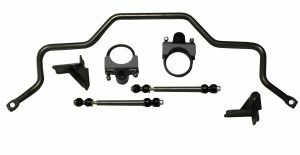 SB-3540PM Front Sway Bar for 1935-1940 Ford (Pinto Mustang IFS). Front sway bar fits with P/M IFS kits. The bar may need to be lowered to clear lower radiator hose on some 1939 Deluxe and 1940 Fords. This is an excellent way to improve the handling. All hardware linkage included. 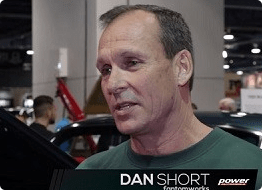 If you are using non-Chassis Engineering full lower A-arms (no strut rods), please include part AU-0010PMA (link) with your order of your Pinto Mustang Swaybar for no additional cost. 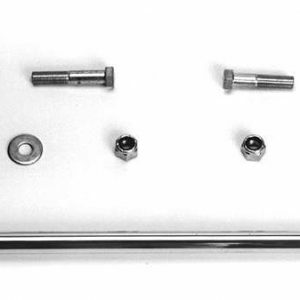 We will substitute weld-on sway bar mounting tabs in place of the regular Pinto Mustang mounting brackets. Drill these holes out to 3/8”. Hold frame brackets in place and mark 2nd hole. Sway bar brackets extend forward. Place the “D” shaped rubber bushings on the bar in line with the mounting holes. Install frame brackets over bushings and start bolts through brackets and frame. Note: If any interference is present, spacers may be installed between frame and frame brackets. The lower mount installs on the lower arm, using the same holes that hold the strut rod in place. Notice that the linkage mounting hole is offset. For stock Mustang width and kits using stock width spacing, the hole goes to the outside. For wider kits the hole faces inward. Check all clearances through full wheel travel.